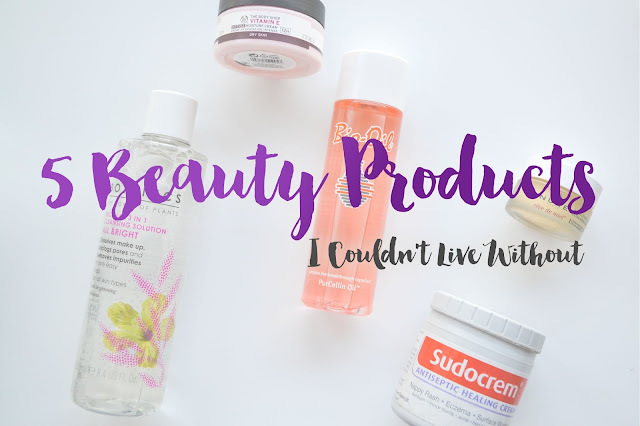 As a beauty lover, I have so many different products that I've lost count of how many I own. Much to my boyfriends dismay, I've taken over his drawers in the bedroom and many of the drawers in the bathroom with all my products. I know it's all materialistic and many of them I really don't need, however, there's a few I genuinely don't think I could live without. I'm not particularly brand loyal for Micellar Water having previously used the Garnier Micellar Water and now using the Botanics All Bright Micellar 3 in 1 Cleansing Solution (full review here). However, I couldn't be without this product. It's so good at removing make up and cleaning my skin, ensuring all impurities are removed. I don't really know what I used to do before Micellar Water was a thing! This might feel like a bit of a strange one, but I genuinely couldn't live without Sudocrem. If you've followed my blog for a while, you'll know how much I rave about this stuff! It's perfect for healing spots quickly, bringing them to a head and helping to clear them up. I've spoken about this in more detail in my Sudocrem - The Best Skincare Product? post so I won't go on about it too much here, but yes, definitely couldn't live without it! I'm pretty sure I've mentioned this on my blog before and following on from the Sudocrem, I apply Bio-Oil once the spot has healed over, but has still left a mark. Whenever I have spots, I always find I'm left with scarring (probably because I'm really bad at picking spots! ), but Bio-Oil is great at reducing the scarring and returning my skin back to it's normal form - I love it. In general, I couldn't live without facial moisuriser, if I was only allowed one skincare product it would have to be this. However, I'm particularly a fan of this one from The Body Shop because it's so nourishing and hydrating which always leave my skin silky soft, I can't beat it! This is another product that I've raved about many times on my blog. For me, lip balm is my safety blanket, it goes everywhere with me. This one from Nuxe is by far the best lip balm I've ever used, it's so good at healing dry lips. I ran out of it a few weeks ago and hadn't had the chance to buy a new one, so had to revert to another brand and it just wasn't the same. The Nuxe Reve de Miel is a firm favourite of mine. I agree with you. I also love micellar water and sudocrem and I can't live without them. And have been thinking about the bio oil, I've heard great things about it. Yes to bio Oil- its definitely my must have oil. I am so excited some one loves it as much as I do!